I'm fortunate to have been part of the "GURPS inner circle" (at least the outer inner circle) for nearly 15 years. 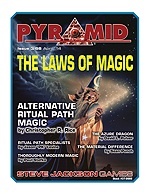 For over half a decade, I've helmed the revamped Pyramid as a full Fourth Edition support 'zine. 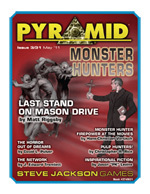 I'm especially proud of Pyramid #3/31: Monster Hunters – where I conspired to assemble goodies for GURPS Monster Hunters before we'd even announced it – and Pyramid #3/66: The Laws of Magic, where at least two articles were awesome enough to be mini-supplements on their own. Even outside the realm of Pyramid, I've done what I can to keep GURPS running as smoothly and entertainingly as possible. I believe I first proposed to Sean Punch the idea of compiling a supplement of meta-game effects you can spend character points on; he then wrote GURPS Power-Ups 5: Impulse Buys, which I'd rank in my Top Ten gaming books ever. Thanks to supplements like Impulse Buys, GURPS Social Engineering, and GURPS Horror: The Madness Dossier, I'm delighted that Fourth Edition feels at least as fresh in recent years as when I first cracked the spine on the two GURPS Basic Set hardcovers 10 years ago . . . or opened those secret digital files a year earlier.